Mayor Michael Bloomberg announced at a news conference Sunday the arrest of Jose Pimentel of Manhattan, "a 27-year-old al Qaeda sympathizer" who the mayor said was motivated by terrorist propaganda and resentment of U.S. troops in Afghanistan and Iraq. 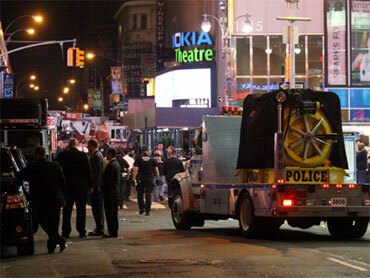 Pimental is accused of plotting to bomb police and post offices in New York City as well as U.S. troops returning home. Complete coverage: Terrorism in the U.S.
Bloomberg said at least 13 terrorist plots have targeted the city since the Sept. 11 attacks. None has succeeded. Brooklyn Bridge targeted: Columbus, Ohio resident Iyman Faris admitted to scouting locations for an al Qaeda attack on locations in New York, and planned to helped destroy the Brooklyn Bridge. Faris, a native of Kashmir who became a U.S. citizen in 1999, was sentenced to 20 years in prison. Subway station bomb plot: Shahawar Matin Siraj was sentenced to 30 years in prison for his part in a plot to bomb a N.Y.C. subway station the day before the 2004 Republican National Convention was to open, as revenge for wartime abuses of Iraqis. There was no proof he ever obtained explosives and was not linked to any terror organization. A friend of Siraj, James Elshafay, pled guilty and testified against his friend; the court released him. Siraj claimed he was entrapped and manipulated by a paid police informant who inflamed him with photos of inmates being abused at Abu Ghraib prison in Iraq. The informant, Osama Eldawoody, was a naturalized citizen from Egypt who was recruited by an NYPD detective after 9/11 to help the department's counter-terrorism efforts. Eldawoody told CBS News he was assigned to visit mosques in Staten Island and Brooklyn, take down license plates in the parking lot, and keep his eyes and ears open for talk of jihad or holy war. Eldawoody denied that he trapped Siraj: "No kind of entrapment whatsoever. The opposite is right: He was the one who was pushing me," Eldawoody told CBS News. Financial targets: In August 2004 seven men were arrested in a plot to destroy the New York Stock Exchange and Citicorp headquarters, among other financial landmarks in the U.S. and London. Dhiren Barot, the group's leader who was described by Britain's top anti-terrorist detective as "a long-term, dedicated, committed member of al Qaeda," was sentenced to 30 years in prison. Hudson River tunnels: There men were arrested for allegedly plotting to destroy the PATH train tunnels in New York City in order to flood the city's financial district. FBI Assistant Director Mark J. Mershon called the plot the "real deal" involving "martyrdom and explosives." The plot's leader, Lebanese national Assem Hammoud, was arrested in Beirut but was released on bail in 2008. He denied the charges in an interview with Al Arabiya TV. Blowing up commercial airliners: In August 2006 U.K. law enforcement arrested 25 suspects in a plot to use liquid explosives to destroy several commercial airliners bound for the United States and Canada. The ringleader, Abdulla Ahmed Ali, was convicted and jailed for a minimum of 40 years. Three British Muslims - Abdulla Ahmed Ali, Assad Sarwar and Tanvir Hussain - were found guilty of conspiracy to murder by detonating explosives on aircraft while they were in flight. They were sentenced to 20 years in prison. Jurors found Umar Islam guilty of conspiracy to murder. Three other defendants - Ibrahim Savant, Arafat Waheed Khan and Waheed Zaman - not guilty of planning to blow up airliners, and did not reach verdicts on whether the three were guilty of conspiracy to murder. All four had pleaded guilty to a lesser charge of conspiracy to cause a public nuisance. One man, Donald Stewart-Whyte, was cleared of all charges. JFK Airport attack: In June 2007 four men - Russell Defreitas, Kareem Ibrahim, Abdul Kadir and Abdel Nur - were indicted for plotting to blow up jet fuel tanks at John F. Kennedy International Airport to avenge perceived U.S. oppression of Muslims around the world. The government's case relied heavily on tapes - secretly recorded by a government informant, convicted drug dealer Steven Francis - of Defreitas bragging about his knowledge of Kennedy Airport and its vulnerabilities. Defreitas and Kadir, an engineer and former member of Guyana's parliament, were sentenced to life in prison. Abdel Nur was sentenced to 15 years; Kareem Ibrahim was also found guilty and is awaiting sentencing. Synagogue bomb plot: In May 2009, in a case which invited criticism of the FBI, four men were arrested in New York City in an alleged plot to detonate a bomb outside a Jewish temple and fire rockets at U.S. military aircraft.Officials said the plot was infiltrated by a government informant who claimed to represent the terrorist group Jaish-e-Mohammaed and arranged to supply the would-be terrorists with fake explosives and an inoperable anti-aircraft missile. James Cromitie, David Williams, Laguerre Payen and Onta Williams were arrested after they planted the fakes devices in the Riverdale section of the Bronx while under heavy surveillance. They charged with conspiracy to use weapons of mass destruction, and conspiracy to acquire and use anti-aircraft missiles. All four were convicted in 2010, the jury rejecting their claims that the sting operation's informant, 53-year-old Pakistani immigrant Shahed Hussain, entrapped the quartet into a plot to win favor from the government and escape punishment in a separate fraud case. David and Onta Williams and Cromitie were sentenced to 25 years in prison. The sentencing of Payen was put off pending the results of a psychiatric evaluation, but the Haitian immigrant was later sentenced to 25 years. U.S. District Judge Colleen McMahon in Manhattan said it was the minimum required prison term, calling the punishment "sufficient, probably greater than necessary." WMD plot: Najibullah Zazi, an Afghan immigrant and airport driver in Colorado, was indicted for "conspiracy to use one or more weapons of mass destruction...within the United States." Court papers said Zazi and others purchased "large quantities of hydrogen peroxide and acetone products from beauty supply stores in the Denver metropolitan area" over three months with the purpose of creating homemade explosives. New York cab driver Zarein Ahemdzay said he, Zazi and a third man met with militant leaders in Pakistan in 2008, and offered to join the fight against the U.S. According to the government, Zazi and his co-conspirators were told by al Qaeda to "hit well-known structures and maximize the number of casualties," CBS News correspondent Bob Orr reports. After pleading not guilty, Zazi (who was accused of receiving explosives training in an al Qaeda terrorism camp in Pakistan) and Ahmedzay submitted guilty pleas to terror charges in a federal court in Brooklyn in 2010. Adis Medunjanin, a Bosnian immigrant, pled not guilty to charges he sought to join his two former Brooklyn high school classmates in the plot. Ahmad Wais Afzali, an imam who was born in Afghanistan but spent most of his life in Queens, was charged with lying to the FBI about phone contact with Zazi. Under the terms of a plea agreement, was Afzali sentenced to time served - four days - and was ordered to leave the country. He and his wife flew to Saudi Arabia. Among his final words on U.S. soil, his lawyer said, were, "God bless America." Times Square bomb attempt: On May 1, Pakistani immigrant Faisal Shahzad lit the fuse of a crude, homemade bomb packed in a 1993 Nissan Pathfinder parked in New York's Times Square before fleeing on foot. He paused to listen for the explosion that never came. A street vendor spotted smoke coming from the SUV and alerted police, who cleared the area. Two days later Shahzad was taken off a plane bound for Dubai. Shahzad said the Pakistan Taliban provided him with more than $15,000 and explosives training, months after he became a U.S. citizen. He pled guilty to 10 terrorism and weapons counts and was sentenced to life in prison. KSM: In a written statement by detained al Qaeda leader Khalid Sheikh Mohammed that was read to a military tribunal at Guantanamo Bay and released by the Pentagon, the self-professed mastermind of the 9/11 terror attacks admitted to having plotted a second wave of attacks using planes as missiles. Among the targets were the Empire State Building in New York and the Plaza Bank Building in Seattle. Mohammed also admitted to having helped plot numerous other attacks, from the 1993 World Trade Center truck bombing to the 2002 bombing of a nightclub in Bali, Indonesia, which killed more than 200 people, prior to his capture by U.S. forces in Pakistan in 2006. Saudi student: Khalid Ali-M Aldawsari, a Texas Tech chemical engineering student from Saudi Arabia, was accused of buying chemicals and equipment to build a weapon of mass destruction. Among the possible targets found in notes: Dams, nuclear plants, the Texas home of former President George W. Bush, and unspecified locations in New York City, which he visited. He pleaded not guilty. If convicted he faces up to life in prison. Manhattan synagogue plot: In May 2001 Two men authorities called homegrown terrorists, one of whom complained that the world was treating Muslims "like dogs," were arrested in a sting operation in New York City. Ahmed Ferhani, a 26-year-old of Algerian descent, and Mohamed Mamdouh, a 20-year-old of Moroccan descent, plotted to bomb a "major synagogue" in Manhattan and bought several weapons and an inert hand grenade from an undercover officer, Mayor Bloomberg said. They were also said to have expressed interest in bombing the Empire State Building. Lawyers for the men allege police entrapment and asked that the charges be dropped, claiming hate crime charges and a rarely-used state terrorism law have been misapplied.